SolidWorks World is always a hyperactive event and the 2012 event in San Diego, CA is no exception. Geomagic is exhibiting and enjoying the crowds of engineers stopping by to see scanning by Hexagon Metrology into Geomagic Studio and Geomagic Qualify. In fact, many of the attendees stop to gaze at the Hexagon Romer SI scanner on the booth. The Romer arm with laser scanner head offers very lightweight use for engineers, high accuracy and fast scanning. The point cloud data is loaded directly into Geomagic software for fast creation of 3D data or inspection using easy-to-use workflows and fast results. Photo above: the Hexagon scanner in use at SolidWorks World. The arm can also be adapted for probing uses with Geomagic Qualify and Qualify Probe. Once data is created in Geomagic, it can be transferred parametrically into SolidWorks 2011 and 2012 for further design and engineering. You can find out more about Hexagon scanners and CMM devices at: http://www.hexagon.com/en/Metrology.htm You can visit Geomagic at SolidWorks World for the next 2 days. 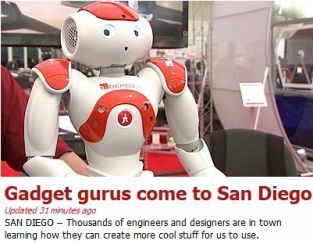 UPDATE: Fox 5 San Diego ran a feature this morning on SolidWorks World 2012. Geomagic and Hexagon Metrology were both featured in the piece. Click on the image below for the full story!